The Rue d’Embas and Rue de la Baudrairie feature a variety of half-timbered houses (a term describing the facade’s structure), dating back to the 15th, 16th and 17th centuries. These homes are the remaining traces of ‘strip-like’ medieval town plots, where houses were deeper than they were wide and mostly built around their back courtyard. These houses are reminders of the town’s past wealth, with its flourishing trade during the 15th and 16th centuries that grew thanks to the production and export of hemp linen. Indeed, the most opulent-looking houses were built and owned by members of the Guild of Overseas Merchants, the Confrérie des Marchands d’Outre-Mer in French, whose marks are still engraved in the stone. The Rue d’Embas and Rue de la Baudrairie feature a variety of half-timbered houses dating back to the 15th, 16th and 17th centuries that were built in depth. Porch houses line the entire north side of the Rue de la Poterie. These porches disappeared following the 1842 Alignment plan. The Rue d’Embas, Rue de la Baudrairie and Rue de la Poterie intersection was named the Bourienne crossroads. Two old wooden halls were built there. A covered hall, thought to have been built during the 13th century, was used for the controlled and taxed sale of meat; and, from the 14th to the 17th century, an open hall was used to sell bread, then meat. These halls were destroyed in 1809 and 1817 respectively. Two other halls stood at the Gâtesel crossroads: the fish hall and the wheat hall. When the Rue Garengeot was opened up between 1856 and 1862, the Gâtesel gate was destroyed. 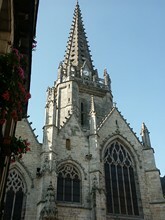 The current appearance of the Notre-Dame church, which was reconstructed from 1440 to around 1582, is in the style of the 15th and 16th centuries. This structure shows the transition from late Medieval times to the early Renaissance period, and was then adapted to changes in taste. Renaissance ornamental motifs can be discerned hidden within its flamboyant gothic decor (left-hand side of the south facade). This church is “multi-gabled”, meaning its aisles feature numerous gables, while their large windows allow daylight to shine through and brighten up the building, which lacks high windows. The main west façade received less work than the south façade. It was hidden by the wooden Great Linen Hall, which was replaced after the 1886 fire with a Butter Hall made with cast iron and bricks. This was destroyed in the 1960s. The construction of this early Renaissance mansion, erected by Ringues de la Troussannais, probably dates back to between 1530 and 1550, a period in which this style flourished throughout Brittany. The L-shaped layout features two wings, connected and accessible via an impressive, square, outer stair tower which dominates the main building with its height. It is constructed from local schist stone and its openings are embellished with Vitré sandstone. Set back from the main street thanks to its enclosed courtyard, this dwelling represents the expression of a new architectural style that appeared during the Medieval period, one which reached its height of popularity during the classical era. It then became an urban townhouse. Through the design, the materials used (stone) and the topographical location within the town (central, opposite the Notre-Dame church) the patron ostentatiously expressed his social bourgeois status, recently enhanced through the hemp linen trade. Following Rue du Bas-Val, you will reach the Promenade du Val and find the Saint-Pierre postern, the well-preserved northern and eastern parts of the town walls, as well as the Vilaine valley and the former Rachapt quarter. The Saint-Pierre postern, to the north, was one of the four gateways used to access the fortress. Dating back to the 13th-15th centuries, it is the only remaining gateway. The three others were the Porte d’Enbas to the west, the Porte de Gâtesel to the south and the Porte d’En-Haut to the east. A postern is a gateway hidden within the town wall, designed to be as unexposed as possible. Pedestrians and horse-riders were allowed to pass through it, while horse-driven vehicles were forbidden. The Pré des Lavandières is a park which was completed in three years by landscape gardener Erwan Tymen, and opened in 1989. It boasts perennial and self-sown plants, which occupy large spaces and create a welcome link to the garden’s more tended areas. Wetland trees and shrubs were chosen to adorn the park. Its location, close to the town centre but still in a natural setting on the banks of the Vilaine river, make it an ideal spot from which to admire the walled town, the château, the Rachapt quarter and the 19th century Bouin tannery. The Porte d’En-Haut is one of the four gateways providing access to the medieval walled town. 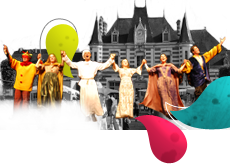 As its French name indicates, it is located in the upper area of the town, to the east, and leads to the old Saint-Martin area (road to Laval and Paris). Its two towers, connected by a porch dwelling, are topped with machicolations. In the 15th century, it was protected by a barbican, a fortified structure from which cannons could be fired. In 1835, the Town council decided to demolish it all. To the left of the gateway stands La Bridole tower, and to the right, the Prisoners’ tower. Soon after 1878, a walkway was built in the moat linking the outer walls to the counterscarp, strengthened in 1591 by the prow, an artillery stronghold. When the Railway and barracks of the 70th infantry regiment were built in the second half of the 19th century, the old Saint-Martin church located in the Saint-Martin cemetery, whose only remaining feature is the bell tower, had become too small and too far out from the town centre compared to the new neighbourhoods. It was therefore decided that a new church would be built using local schist stone. Its high walls now dominate the town thanks to its central location, and it has become a ‘counterweight’ to Notre-Dame church, its eternal rival. The Mellet architects from Rennes, fervent Catholics whose father Jacques came from Vitré, were commissioned for the project. As admirers of Romanesque art, they chose a neo-Romanesque architectural style, even though the inner vaulting is formed from ogives. The church is designed with an oriented Latin cross ground plan featuring a limited transept. The central nave has five rows and is lined with two aisles that run down around the choir. As per tradition, there are three levels: from the vast arcades to the wide galleries to the high windows. 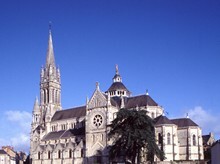 The cupola is the edifice’s focal point and is located at the transept crossing. This building, erected by the Hay des Nétumières family, dates back to the first half of the 18th century. 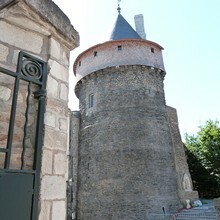 It is built on the same site as the residence owned by Madame de Sévigné in the 17th century, the ‘Hôtel de la Tour de Sévigné’, whose name is derived from a town-wall tower annexed to the house. This new 18th century residence was built on the town’s old south wall, used as foundations. 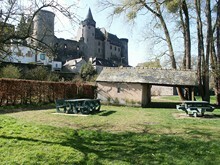 The wall’s levelled tower became a terrace leading down to the French formal gardens adorning the town’s old moats to the south (both tower and moats have now disappeared). To the north, the courtyard entrance opens out onto the present-day Rue de Sévigné. This townhouse was therefore set between a courtyard and a garden, an architectural style that emerged in the 17th century in Paris, with architects such as Mansart and Le Vau. The simple façades are striped with bands that separate the floors, cornices, corner reinforcements and window frames, and are the only features made from cut stone. The walls are made from schist quarry-stone covered in a lime coating, as was frequently the case in Brittany (like at the Malouinières residence). In the 1850s, the Chemins de Fer de l’Ouest commissioned the architect Victor Lenoir to build the neo-Gothic Vitré railway station, which blends in harmoniously with the town’s medieval architectural landscape. Alternating brick and limestone, the white and pink colours fit in remarkably well with the urban backdrop: situated just outside the ramparts, the building expresses the town’s modernity, given that railway stations were symbols of innovation at the time. This former suburban manor, once home to the Barons of Vitré, was more comfortable than the medieval château and dates back to the first half of the 17th century. A French-style painted ceiling depicting the coat of arms of Marie de la Tour-Bouillon, who married Henri de La Trémouïlle in 1619, proves that the manor was indeed built at that time. The main rectangular building, at the back of the courtyard, boasts a double pavilion in each corner, forming wings. This sober building was built from Vitré sandstone. An 18th century watercolour reveals its original features: an avenue once ran down to it (now the Champ de Foire) and it was surrounded by tree-lined alleys leading to various gardens and meadows. Deemed emigrant property during the French Revolution and acquired by the town in the late 19th century, the Jardin du Parc and the Military Barracks took over part of the domain. Restored in 1934, this château houses the regional Public Works office. A development project was launched in 2003 to enable it to house the Vitré Communauté headquarters. The Château des Rochers-Sévigné, visited by Madame de Sévigné on her many travels between 1644 and 1690, dates back to the 1500s. A 1763 architectural plan paints us a clear picture of it was. It was modified in the late 18th century by the Hay des Nétumières family. The museum, which has occupied part of the residence since 1990, displays various portraits and objects recalling the famous letter writer from the time of Louis XIV. It is also worth visiting the octagonal chapel dating back to 1671-1675 and the French formal gardens created by her son Charles in 1689, originally based on a design by Le Nôtre and redesigned in an identical manner in 1982 with the support of the Amis des Rochers-Sévigné association. The park he designed and planted has mostly been conserved in its original form. 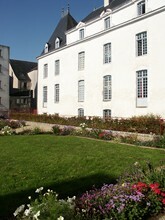 Opening times: Musée des Rochers-Sévigné (Low season: 1 October to 31 March). From 2 pm to 5.30 pm. Friday, Saturday, Sunday. Groups by reservation on other days. (High season: 1 April to 30 September). From 10.30 am to 12.30 pm and from 2 pm to 6.30 pm. Open daily.